This is a rather long post, more of an essay than a blog. So, you can skip the details and cut to the lessons learned and where do we go from here (wherever you are) and go to the last paragraph or two. On the other hand, if you are a sucker for details and want to read and digest the 1677 words, have at it. Takes less than 15 minutes to read it through. As our friends and family know, we have been active and ardent RVers for the past 20 years, having previously enjoyed 6 different motor homes and extensive travel in the U.S. Canada and Mexico. These included a vintage 1975 GMC Transmode converted to a motorhome by the previous owner, a cabinet maker. Others included a ’96 Barth Regency, a Roadtrek RS Adventurer, an Allegro Bus by Tiffin, a top of the line, 2006 Newell and a wonderful 2006 Dynamax 32 XL on a Freightliner chassis with a Caterpillar engine and that terrific Allisojn 6-spd transmission. Thinking we might be finished with the mobile life style, we sold our 6th motorhome which was before we moved from NM to CA. After 8 months in CA we began to get restless and sensed a desire to get back on the highways again. 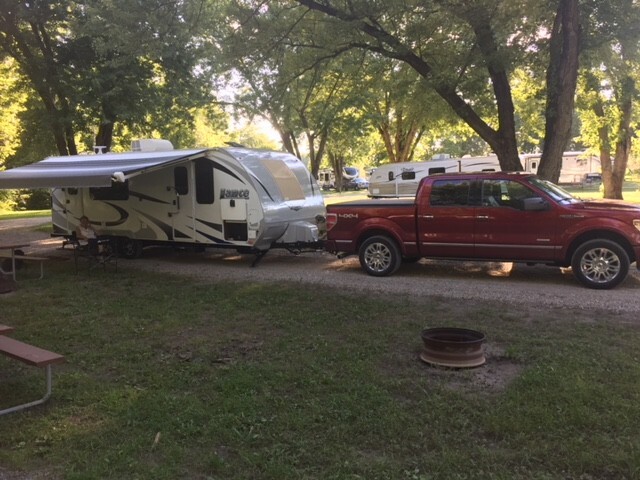 So, this past July, we opted for a Lance travel trailer, model 2285, a small camping trailer that meets all our needs, less expensive and less complicated than any of the Class A, B and C motorhomes. We already had the truck that pulls It and you can see both in the featured image. https://www.ncbi.nlm.nih.gov/pmc/articles/PMC2800107/ We took some extra time to decide whether we would go on to Maine or do a U-turn and return to California. The decision, all things considered, was to go on to Maine. We left OKC on September 16, stopping in places like Marshfield, Missouri; Greenfield, Indiana; Westfield, New York (on Lake Erie), Schenectady, New York and then to Red Apple Campground in Kennebunkport, Maine. It was good to be there. From our point of departure on 8/28 to point of arrival, 9/19, 23 days and 4000 miles. Plans were to enjoy southern Maine, entertain some of Susie’s high school classmates at a lobster feast and then go on to Vermont for a long weekend before heading back to CA. However, as you all know, life is what happens while you’re making plans. On Monday, September 24, Susie got a shocking phone call from her sister Judy, that her son Jeff, age 51, and who lives in Hong Kong, and was visiting Judy in Santa Fe had a heart attack and died there. So, we got our stuff together on Tuesday and on Wednesday morning, flew out of Manchester, NH, about an hour from where we were in Maine, through Baltimore to Albuquerque and then rented a car and got to Santa Fe Wednesday afternoon. I told the family I would put a Memorial Service together for Jeff which we held on Friday for about 60-75 people, large family and many friends. Jeff’s friends from high school in OKC, from college days at DePauw in Indiana, from graduate business school in Phoenix and a few from Hong Kong as well. These people along with Jeff’s wife and 3 boys, his parents, aunts and uncles and numerous cousins gathered Friday afternoon in a beautiful setting just outside Santa Fe to celebrate Jeff’s life. As I told everyone there, we all have an appointment with death someday, somewhere, and few can predict when, where or how that will be kept. Rest assured it will happen as sure as night follows day. There are those occasions where one has time to prepare and get ready to leave this world. However, the death of a loved one is most often followed by a deep sense of loss and a time of mourning and grief. Healing that open wound takes time and a great deal of care. I made a visit on Saturday to the ER at the St. Vincent Hospital in Santa Fe to have some tests and gather some more data regarding the ongoing medical issue. On Sunday, September 30, we got a flight out of Albuquerque back through Baltimore and to Manchester. We spent the night there, drove back to Kennebunkport on Monday, October 1 and picked up our dog who had been at a kennel all week. We then took a couple of extra days for rest and recovery before setting out for home. We left Maine on Thursday, drove to Port Byron, NY near Syracuse, and the next day on to Milan, Ohio, near Toledo, and it looked like mostly Interstate 80 all the way to Sacramento. We stopped overnight in Utica, Illinois, west of Chicago, about halfway across Illinois. Lots of rain poured down the next several days and we drove in rain all day and set up in a campground outside of Earlham, Iowa, just west of DesMoines. We did not get as far as hoped due to weather and heavy traffic, maybe due to the holiday weekend. I had seen that it was 3119 miles from Kennebunkport to Copperopolis, CA. On this kind of trip, we’ve been learning to count on numerous changes so as we looked at the weather farther west on I-80 and saw snow forecast in CO, UT and WY, we opted to go south and back to OKC for awhile. On the second day there, a small tornado touched down just a few miles from our campground and we were hit with the edge of it with 75 mph winds, driving rain and that thunderous noise that people describe sounding like a freight train, or I would say, a jet engine revving up to take off. We survived quite well, stayed dry and warm in our cozy camper. Since we were back in OKC and had a return visit to the hospital scheduled for later in the month, we decided to stay on rather than beat it home to CA and after a few days there turn around and fly back to OKC. So, under the expert guidance and talent of several cardiologists at Integris Southwest Medical Center in the Heart Hospital there, I had some diagnostic tests that included a TEE (transesophageal echocardiogram) one day and an arteriogram the next day. The conclusions, after consultations with four different cardiologists, are that the leaking mitral valve is the culprit and that needs to be repaired. The risk of open heart surgery to fix both the valve and the Afib is increased with age so we are opting for a lesser invasive procedure known as a Mitral Clip. For the uninitiated, that procedure repairs the damaged mitral valve via a vein in the leg up through the chest and into the heart area.. The clip stays there permanently which helps that valve to function properly again. There is a very high rate of success with this surgery, thus the high incidence of such repairs. A return visit to the Integris Southwest Medical Center and the Heart Hospital there is scheduled for November 19. We left OKC on Monday, October 22, with overnight stops in Albuquerque, NM, Kingman, AZ, and Visalia, CA arriving home Thursday afternoon, October 24, four days short of two full months on the road. So, if you’ve gotten this far, no pun intended, what do you make of all of that, what lessons were learned and where do we go from here? Those are big questions and I will try and sum up briefly as we are already more than twice as long as my usual blog size. First of all, the trip planned was not the one that evolved and we made numerous changes and adjustments along the way to meet unexpected needs. Isn’t that just like work, relationships and life as we know them? It might not have been as much fun and pleasure as we had anticipated but we had no mechanical problems regarding travel and we covered just over 7000 miles. We have had the blessings of many trips, visits with family and friends and have probably seen more of the U.S,. Canada and Mexico than most people. Gratitude rules! Lessons learned: In addition to accepting conditions that we can’t change, we can follow the serenity prayer and change what we can and ask for the wisdom to know the difference. While we could not change the weather, we could look ahead at what was forecast and change our directions. We couldn’t change some physical issues on our own but we could find and ask for the best help available. Where do we go now and what’s next? As far as travel is concerned, plans on the drawing board are to settle in here in northern CA for the next three weeks, make the trip back to OKC for the procedure at Integris, enjoy and celebrate Thanksgiving by giving thanks for so many blessings and unexpected gifts, spend at least January, maybe longer, in Mexico and then take inventory to consider both where we are and where we want to be. Reading, writing, deep conversations, spending time outdoors, eating and living well, being in the now, fully present. That is more than enough and enough is as good as a feast. Thanks to each of you and may you enjoy this season to the fullest.